Yes, fully immersive virtual reality experiences are amazing, we agree they are (well the good ones, at least). But if you’ve not the time, inclination, or King Midas-level bank account to deep dive into that side of digital entertainment then allow us to ARm you (get it!) with our selection of the best augmented-infused playthings. These are the best AR toys on the market today and they are guaranteed to amuse you and your smartphone plenty, while also not take up too much of your time or raid your wallet like a pirate captain. Many of these toys are not just AR-infused either, but injected with educational value as well, meaning that their owner can get smarter while they have insane fun, too. See what Iron Man might see as you battle foes in your front room. With the Hero Vision app and smartphone device stuck inside the mask, you’ll put the included markers around the place and go into battle, take on AR adventures and generally be as Marvel as you can possibly be. Aimed at kids, of course, but appealing to more mature fans as well no doubt, there are over ten levels to play in order to save the planet from mad titan man Thanos with the gauntlet and Infinity Stone accessories. To get the absolute max from your mask set you’ll need a decent amount of space and, by moving the AR markers around you’ll get a new play experience each time. Not a bad piece of superhero wear at all. Get you actual guts out, well, an AR rendition of them at least. A very decent party trick for Friday nights out indeed the pattern on the tee scanned by the app brings your innards, out. 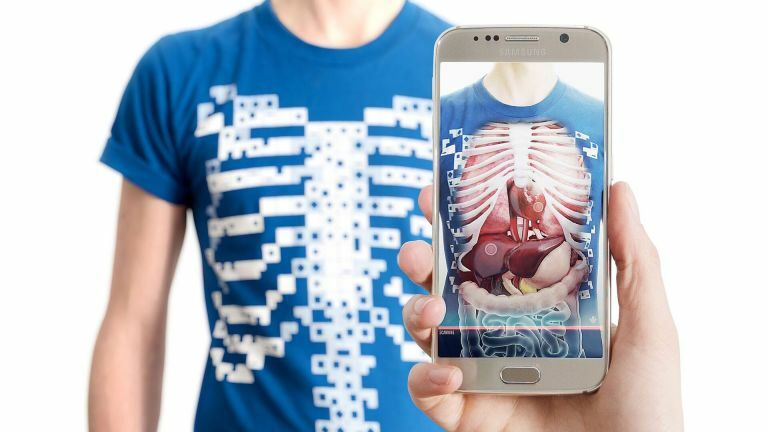 Developed as a learning tool, the rib cage styled top comes to life on a smart device for you to have a poke around at the wearers organs. It delivers a pumping heart and lungs at first and then its up to you to take things further. Tap on the item of interest and get info on how these working parts work whilst embarking on an entertaining anatomical adventure. We’ve included this toy before in other buying guides intergalactic friends, however, this mixed reality play masterpiece deserves its place in this round-up purely due to its “wow” factor. Load up your handset into the headset, place the guidance orb on the floor, power up your diatum driven hilt, and then you’re off. Play is selected from the various planets on offer which you look at and hit the hilt to select - of course, though, you should start with a death match versus Darth Maul. As well as battling the red-faced foe there are many more droids and enemies to face off against as well, and you can switch things up and get involved in battle planning before unleashing AR troops across your office based battle field. Most importantly, you can also get down to some classic Star Wars holographic chess, too. Cheap as chips yet twice as nice we’d say. The Merge cube has been having a time of it over the pond selling millions of its AR infused cubes last year. There’s little reason we can see for it not doing really rather well elsewhere, too, with the small spongy thing gathering plenty of plaudits for its content offered via the QR-like glyphs on each side. MERGE provides a kid-friendly content platform, the MERGE Miniverse, housing over 25 MERGE Cube app experiences. MERGE Cube educational experiences let kids to get immersive and explore by going back in time with Dino Digger, through space on Galactic Explorer and do inside the body with Anatomy AR – pure animated excellence. The cube also offers gaming experiences such as THINGS, with one-minute wonders including winding a jack in the box out of his abode to slicing a watermelon, all, on their own, fairly mundane, but highly entertaining for a few moments. Other gaming experiences include an impressive Minecraft-like game Dig, and guiding a virtual ball across various animated terrains in Tiltball, each taking a while to perfect and good solid fun to play. There's also solid retro gaming Snake Attack which we like very much. Get on board with this handy holographic cube now and enjoy the ride. Packed with puzzles and games, Parker the Bear is your cute new mate. Exclusive to Apple in the UK this bear from Seedling has plenty to tell and teach. Up front Parker is a classic bear, no connectivity or batteries inside but brought to life purely via the app. But more than that Parker offers an abundance of educational content on subject matter including science, technology, education, arts, and maths. There’s little reason not to have a bear like this in your abode - well, it might take some explaining why if you haven’t got anyone under five years of age around. Travelled the world and the seven seas? Complete with an interactive smart pen that touches on the surfaces of the planet to offer audio info, this AR-infused globe ticks lots of boxes. Firstly, everyone should have a globe at home, and this one offers up all manner of information on geography, culture and such with the ability to open it up to reveal a solar system in its core. Get the AR aspect going and bring all of the educational elements to life to keep you entertained and informed. The Swapbots project has been funded for some time now and are grafting like demented beavers to get the product out to the first round of backers. We’ve seen the latest iteration of this mixed reality play and those on the receiving end are going to be getting more than they bargained for. The video-like game play of these cardboard boxes is outstanding. Nine initial creations can have their three pieces swapped with each other to create new characters, with over 700 combinations in total offering massive play potential. Discover new characters, collect currency, create stories – unputdownable!